The Cyclo-cross World Championships concluded with vindication for the Belgian hosts at Koksijde in the all important Elite men's race when not only did they sweep the podium, but took all seven of the top positions - the entire team finishing ahead of any other nation, a first at a world championships. Niels Albert, who had not been talked up in the same fashion as team mates Sven Nys and Kevin Pauwels or two-time defending champion Zdenek Stybar of the Czech Republic, was the dominant rider of the 60 minute race, taking the lead on the first lap and riding away from the rest of the field. 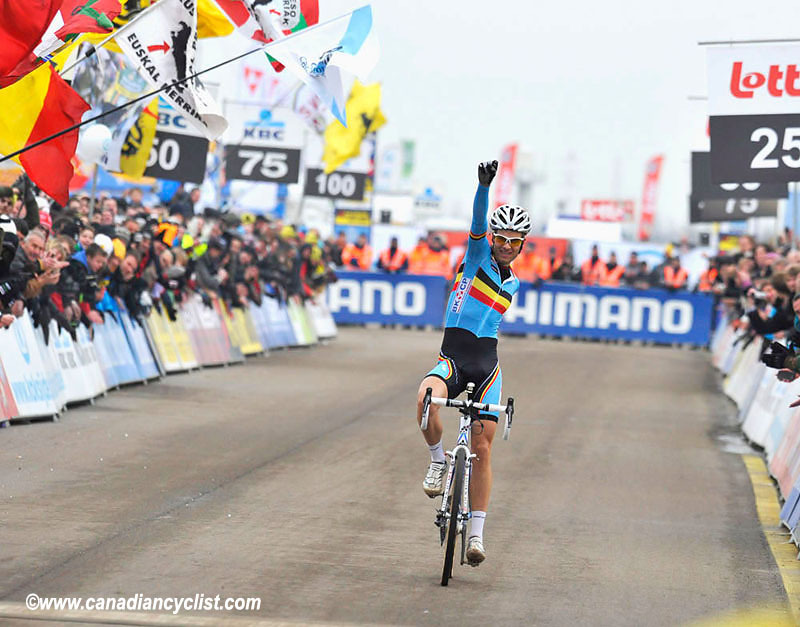 Rob Peeters took silver and Pauwels third. Craig Richey, Canada's only entrant, finished 51st. The crowd had swelled further from the women's race in the morning, with highly believable estimates putting the total at a staggering 61,000 people. Organizers wisely decided to close the crossing points after the first lap of the race and, as a photographer, it often felt like you were swimming through the crowd to get from place to place. However, the crowd was extremely good spirited, cheering on all competitors, with the pitching reaching a deafening level when the Belgians came through. Albert went to the front on the first lap, closely followed by Stybar, who was the only rider to attempt to stay with him. Stybar, riding a pink Specialized bike, quickly dropped off the pace, and then steadily went backwards, eventually finishing 13th. Nys took up the chase next, and held onto a top-4 spot through much of the race, with a selection of other Belgian riders joining him for a while before dropping back. With two laps to go, and Albert over 50 seconds ahead of the chasers, a group containing all of the Belgian team formed, and started to make some time on Albert. But the pace shredded the group within a lap, and Pauwels and Peeters dropped the rest to chase for the remaining podium spots. Peeters dropped his rival in the final half lap to take silver. Craig Richey was disappointed with his result, after being pulled just before the halfway point. However, after getting caught behind a crash at the start, it was difficult to move up. Read our interview with Craig Here.